Do you also drink hot chocolate? Did you know who laid eyes on the first chocolate ever? Is chocolate a delicacy that mistakenly skipped through the heavens and landed in our hands? Chocolates were first discovered by a group of the ancient Mayan tribesmen between 500 to 600 C.E in the form of an exotic bean known as the cocoa bean. Cacao - or chocolate - symbolized the wealth and power among the ancient Maya. Cacao seeds were the little coins we use today as pennies, they were used as currency and the Mayans traded using cacao beans. The Mayans paid great tribute to chocolate and great chocolate plantations were later grown by the Aztecs and the Incas. The Mayan descendants still continue to relive the tale of chocolate as a shrine offering to the gods as a symbol of welcoming health and wellness as well as being a couple in love together on their wedding. 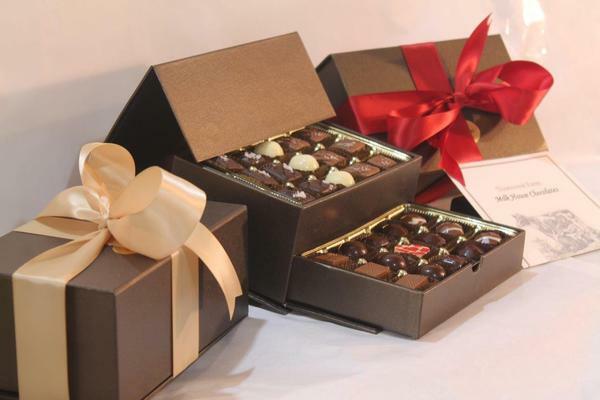 They claim the chocolate to possess the Cupid touch, making the couple's fall harder in love than ever before!!! Years later, earlier than the advent of tea and coffee, the Europeans opened chocolate boutiques especially the French people, fashioning chocolate into little sweets, truffles, and delights sold at chocolate. The most favorite chocolate house I've ever liked was Guylian, at The Rocks, Sydney. In the Johnny Depp movie, Chocolat, we had seen a smart, young chocolatier, Vianne Rocher, of the Mayan roots keenly enchant a slumbering French town Lansequent-sous- Tanner to the north of chocolate with her scrumptious chocolate delights and truffles! However, apart from the relishing taste, the designed packaging of chocolates is one big, amiable factor that quickly catches the fancy of a chocolate lover in an instant! The finer is the packaging design, the greater is the desire to buy that particular chocolate rather than the insipidly packed ones. A fine packaging imparts tons of accolades and glory to a product and appeals charmingly to an onlooker. Ever since the flow of decades and centuries, the creativity of a packaging innovation has to lead the packaging experts to hunt high and low, exploring the milky chocolate avenues of their imagination. While some designers inscribe the label right on the top of packaging for catching the direct glance, other designers blend the logo in a subtle, artistic manner. In this case, the packaging is so imaginatively fabricated in a bevy of colors and motifs that it might be mistaken for a relic of art rather just an ordinary chocolate wrapping. Anyone that eyes this chocolate can immediately figure out that the Utopic Chocolate bars are some extraordinary chocolate bars that are lovingly wrapped by hand using a colorful wrapper. The packaging is extravagantly designed using an elegant white packaging. The brand logo is designed in the simplest yet a classical manner and thus, the entire packaging is rather tastefully created. The gold and white boxes, designed sumptuously with an ebb and flow of lusciousness, is indeed awe-inspiring to bits and it is perceptively deigned to catch the eye of a client in a blink, with its choice of lively colors and logo written in black. As the brand name suggests, this famous chocolate label represents aristocracy and elegance, featuring the old English aristocracies wearing classy eyeglasses, top hats, and vintage headdresses to depict the artistic epoch of the Roaring Twenties. This obsoletely conceived packaging is a handsome pick to gift someone with the most sophisticated panache. Blended with a fineness of coarsely grained, crude chocolate beans, the Crude Raw Chocolates depict the impeccably sophisticated design using the simplest tones of a bronzed backdrop with touches of thinly inscribed logo fonts to hint the ultimate delicacy. The chocolate boxes is rather a fascinating blend of geometric designs and corrugated cardboard packaging material, adding a sprinkle of an art deco touch and finesse to the final product. A somber palette of the sublimely blended shades is chosen to depict elegance and a minimalistic style, coexisting together at their best. Being the wild fantasy of a dreamy chocolatier, this chocolate packaging comes as a breath of fresh air, with a pristine classiness of a modern design. The finesse blending of sooty black and gold hues, ingrained in a classical style, gives a dark touch of magic, making the chocolate buyers feel a rush of an overwhelming, ecstatic feeling as they grab and open the chocolate packing. It is a great pick for the lovers of the good old Nutcracker characters, especially among the young children. The chocolate boxes is rather a fascinating blend of geometric designs and corrugated cardboard packaging material, adding a sprinkle of an art deco touch and finesse to the final product. A somber palette of the sublimely blended shades is chosen to depict elegance and a minimalistic style, coexisting together at their best.